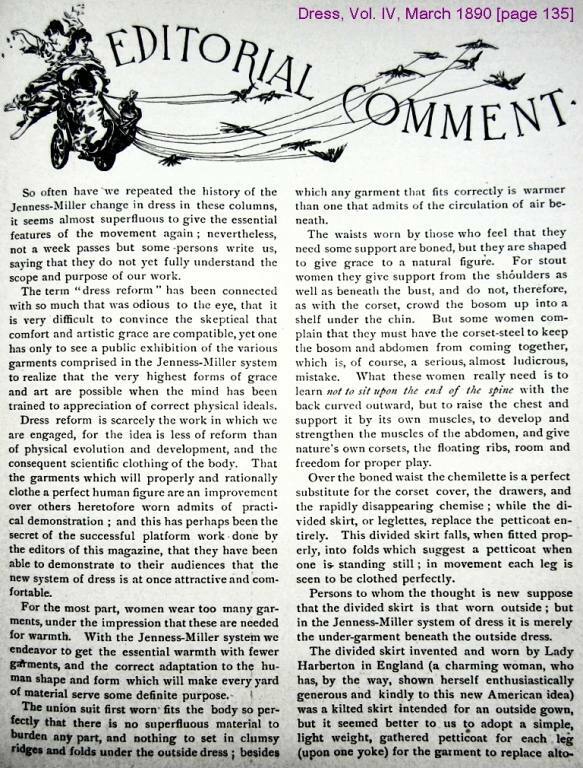 Annie Jenness-Miller published her "rational dress" -- or "dress reform" -- magazine, called Dress, beginning in 1887; I have not seen copies of Volume I or III, but Volume IV began in January of 1890, so Volume II presumably began in January of 1888. Since copies of Dress are very rare, I will share the photos of pages that I took several years ago. To the right are all three pages of her "Editorial Comment" section from March 1890, Volume IV, pages 135 through 137. It was not illustrated, since she was expanding upon previous articles. I will supply illustrations of the Jenness-Miller reform undergarments from other issues of the magazine, whenever I have them. Click on the images, then select the full-screen view to enlarge each page to a readable size. On page 135 she writes, "Dress reform is scarcely the work in which we are engaged, for the idea is less of reform than of physical evolution and development, and the consequent scientific clothing of the body." 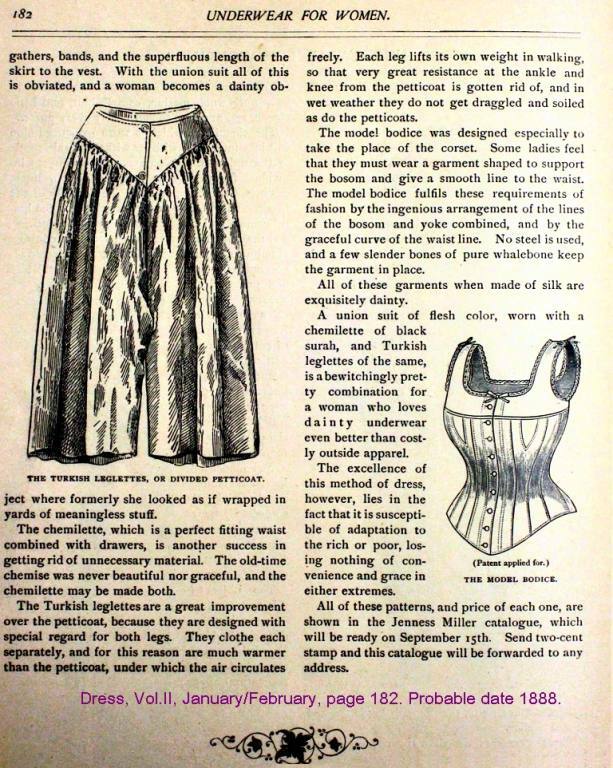 "For the most part, women wear too many garments.... With the Jenness-Miller system we endeavor to get the essential warmth with fewer garments, and the correct adaptation to the human shape and form...."
Scroll down to read her two-page illustrated article on underwear for women, from Volume II of Dress. 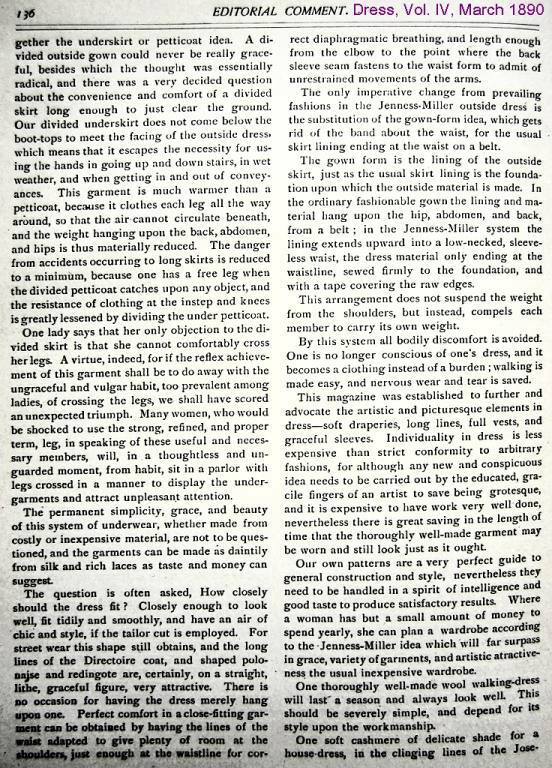 On page 136, Jenness-Miller explains that Jenness-Miller Patterns, which could be ordered from the magazine, do not constrict the waist, because the garments are constucted upon the "gown-form, which gets rid of the band about the waist" instead of "the usual skirt lining ending at the waist on a belt." "In the ordinary fashionable gown the lining and material hang upon the hip, abdomen, and back, from a belt; in the Jenness-Miller system the lining extends upward into a low-necked, sleeveless waist [i.e., under-bodice], the dress material only ending at the waistline, sewed firmly to the foundation, and with a tape covering the raw edges. This arrangement does not suspend the weight from the shoulders, but instead, compels each member to carry its own weight." Casting light on the prudery of her era, on page 136 Jenness-Miller criticizes women "who would be shocked to use the strong, refined, and proper term, leg, in speaking of these useful and necesssary members," but who "will, in a thoughtless and unguarded moment, from habit, sit in a parlor with legs crossed in a manner to display the undergarments and attract unpleasant attention." 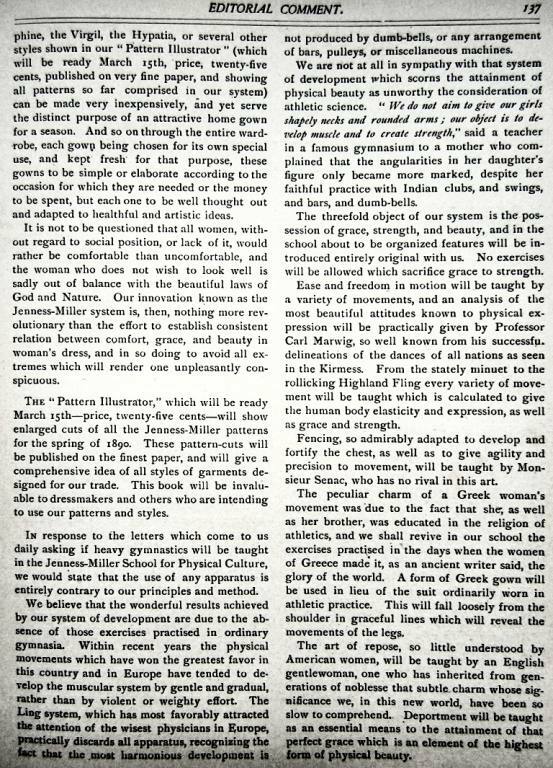 On page 137, the editor discusses her "Jenness-Miller School for Physical Culture." 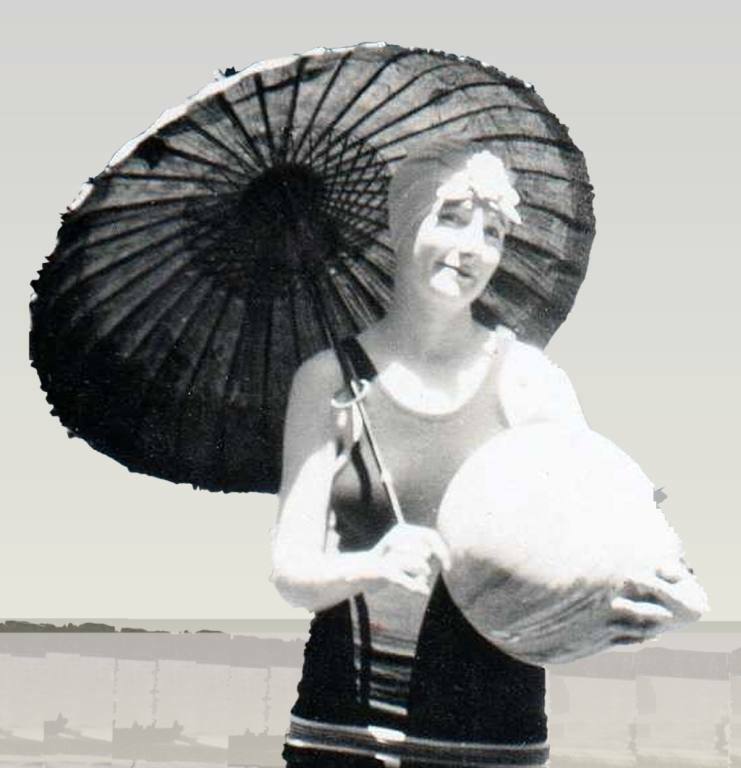 She believed that women would be able to do without corsets if they strengthened the muscles of the abdomen through exercise, giving "nature's own corsets, the floating ribs, room and freedom for proper play." "The three-fold object of our system is the possession of grace, strength, and beauty.... No exercises will be allowed which sacrifice grace to strength.... Ease and freedom in motion will be taught by a variety of movements [including dance.] "Fencing, so admirably adapted to develop and fortify the chest, as well as to give agility and precision to movement, will be taught by Monsieur Senac, who has no rival in this art." "A form of Greek gown will be used in lieu of the suit ordinarily worn in athletic practice. This will fall loosely from the shoulder in graceful lines which will reveal the movements of the legs." This illustrated article, "Underwear for Women," appeared on the last two pages of Dress, Vol. II, January-February, presumably 1888, pages 181 and 182. 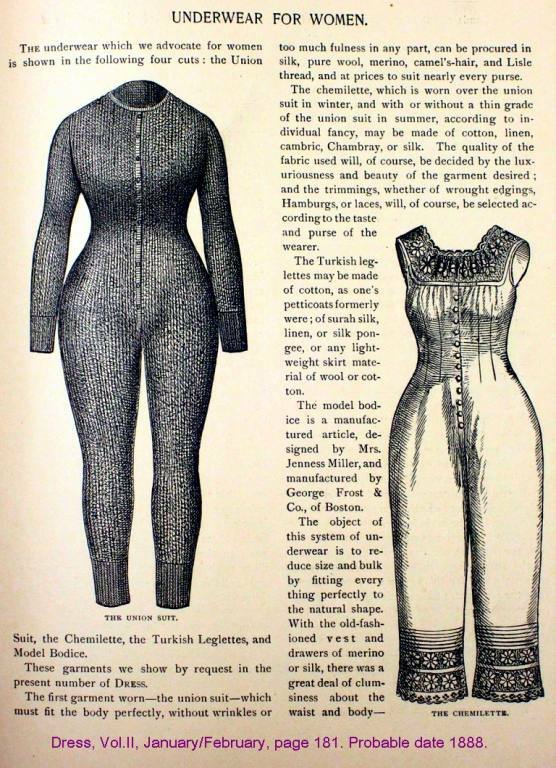 Jenness-Miller suggested The Union Suit as the first layer, "which must fit the body perfectly, without wrinkles or too much fulness in any part." It was knit of silk, pure wool, merino, camel's hair, [or] Lisle thread... at prices to suit nearly every purse." "The Chemilette, which is worn over the union suit in winter, and with or without a thin grade of the union suit in summer, may be made of cotton, linen, cambric, or silk." The trimmings, of lace, etc. "will be selected according to the taste and purse of the wearer." "A union suit of flesh color, worn with a chemilette of black surah, and Turkish leglettes of the same, is a bewitchingly pretty combination for a woman who loves dainty underwear...."
The Turkish Leglettes or Divided Petticoat "may be made of cotton, as one's petticoats formerly were; of surah silk, linen, or any light-weight skirt material of wool or cotton." The Model Bodice was "designed by Mrs. Jenness Miller and manufactured by George Frost & Co., of Boston." It was "designed especially to take the place of the corset.... No steel is used, and a few slender bones of pure whalebone keep the garment in place." "All of these patterns, and price of each one, will be shown in the Jenness-Miller catalogue, which will be ready on September 15th. Send two-cent stamp and this catalogue will be forwarded to any address."